Both the Sena and the JD(U), which is headed by Bihar Chief Minister Nitish Kumar, are members of the BJP-led National Democratic Alliance (NDA). Mumbai: Political strategist and JD(U) leader on Tuesday visited Shiv Sena chief Uddhav Thackeray at the latter’s residence in Mumbai. The surprise meeting, which created buzz in the political field, came at a time when the fate of the electoral tie-up between the BJP and the Shiv Sena is hanging in balance. According to news agency PTI, Kishor expressed a wish to join hands ahead of the Lok Sabha polls. The Sena, which is part of the Central and Maharashtra governments, has been at loggerheads with the BJP. Kishor is credited with conceptualising and implementing innovative strategies like ‘chai pe charcha’ with Narendra Modi, who was the BJP’s prime ministerial nominee at that time, that are said to have contributed to the BJP’s stupendous victory in the 2014 elections. He is currently the vice president of the JD (U). “As part of NDA, we look forward to joining forces with you in Maharashtra to help secure victory in upcoming Lok Sabha elections & beyond. @nitishkumar,” Kishor tweeted while tagging JD(U) president Nitish Kumar. Kishor re-tweeted Shiv Sena youth wing president Aditya Thackeray’s tweet welcoming him at their residence “Matoshree” in suburban Bandra. “Thank you for your warm hospitality Uddhav ji and @AUThackeray,” he tweeted. Earlier this afternoon, Aditya tweeted: “Today Uddhav Thackeray ji and I had a special visitor over lunch. Some great talks @PrashantKishor ji”. The Thackeray junior also tweeted photos of Kishor meeting his “hosts”. 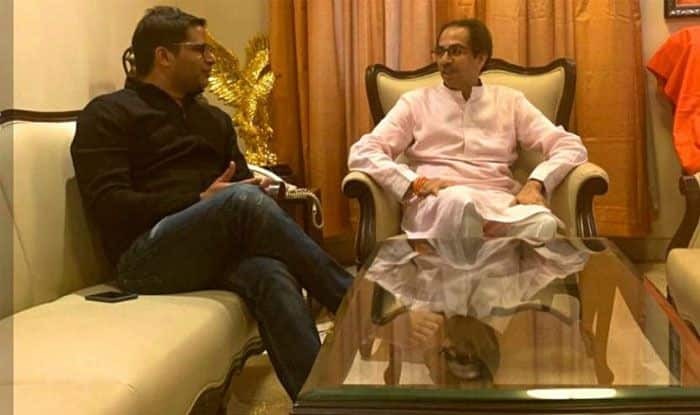 A close aide of Uddhav Thackeray said no senior BJP leader had visited the residence of the Sena chief since 2014 except BJP chief Amit Shah, and held talks about the alliance between the two parties. Sena leaders refused to divulge details of the meeting between Uddhav and Kishor. After falling out with PM Modi, Kishor worked with Bihar Chief Minister Nitish Kumar for the 2015 assembly elections campaign. He was reportedly instrumental in bringing Nitish and his arch rival RJD chief Lalu Prasad Yadav to take on the BJP during the polls. Kishor was later roped in by the Congress for the assembly elections held in Punjab and Uttar Pradesh in 2017. While the Congress returned to power in Punjab, it fared badly in Uttar Pradesh. Several Congress leaders like Randeep Surjewala had hailed Kishor for the Punjab outcome. In Maharashtra, future of electoral alliance between the Sena and the BJP is under cloud with the Uddhav Thackeray-led party giving mixed signals about its willingness to contest Lok Sabha polls with the BJP by its side. Both the parties had contested the 2014 general elections in an alliance, but went solo in the assembly elections held in October that year. Sena on January 24 last year announced to contest all the forthcoming elections on its own strength. The party has been criticising the BJP and Prime Minister Narendra Modi on a range of issues in the party mouthpiece “Saamana”. Meanwhile, Sena leadership held meetings with its Lok Sabha and Rajya Sabha MPs as well as with MLAs and MLCs Tuesday.